My historical novel of immigration, When We Were Strangers, is set in the 1880s, when Irma Vitale leaves her mountain village in Southern Italy and comes to America. My “research” began in November, 1990, when I left Northern California to live in Naples, Italy with my fiancé, Maurizio, and felt the searing displacement that might have been Irma’s. I’d been to Italy as a tourist on the customary circuit. Nothing of those sunny easy days prepared me for life in the center of Naples. I had worked in California as a freelance writer with some success. In Naples I could barely frame a sentence. Shopping, the gay experience of so many American-in-Italy films, was complex. “You bombed this!” one man said accusingly, pointing to a church damaged by the Allies during World War II. I went to school in the morning and food stores closed in the afternoon, opening on what seemed a secret schedule. When could I shop? The discovery that food stores don’t open at all on Thursday afternoon threw me into a fuming rage, an overwhelming passion to shop for groceries on Thursday afternoons. Tense and frustrated, I got tangled up in verbs and participles. On vacation, it could be fun to point and playact and muddle along in a new language. Since I was living here, I wanted to be perfect, at least grammatical. And of course I wasn’t, far from it. “Relax,” said Maurizio. But I couldn’t and wasted time learning words of limited utility in the present circumstances: “cianura” — cyanide, and “defenestrazione” — killing people by throwing them out of windows. November was cold and rainy; our apartment unheated. We lived in coats. 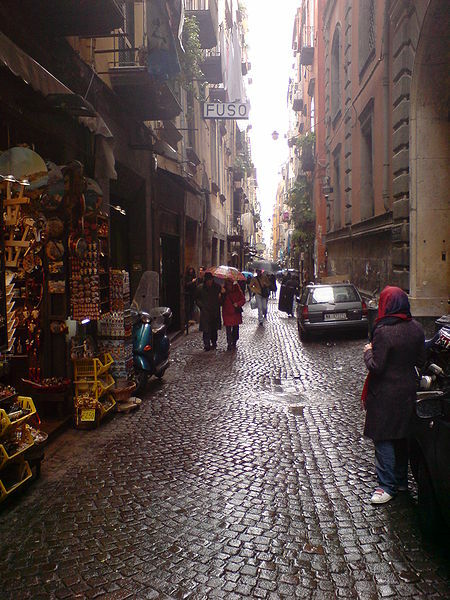 In the old quarters of Naples, roads are paved with basalt; buildings climbing overhead were dark with age, opening to slits of gray sky. No parks, trees or grass. I knew that in a walled medieval city, parks are an unreasonable luxury, yet I ached for California’s green. friend – It\’s encouraging to see meaningful info like this on the internet. Lots of times people are just putting content out on their blogs for the sake of content, but the info here is actually useful and something that I am able to put to use. Thanks much!